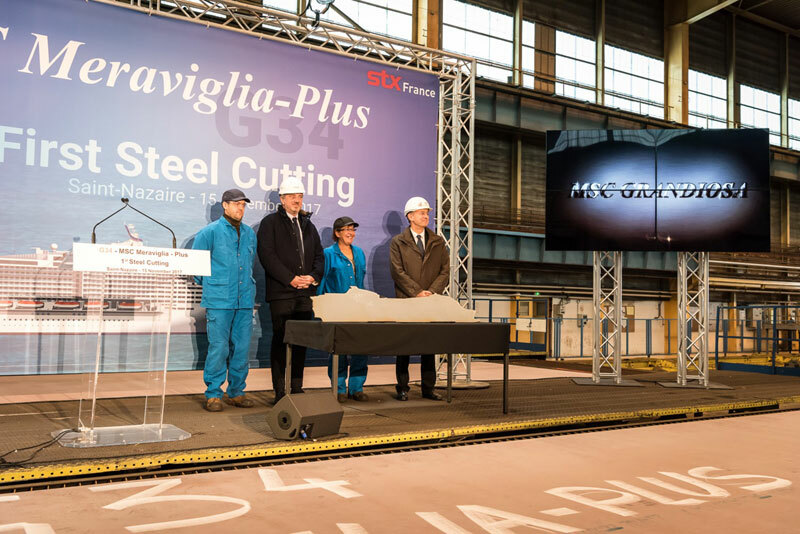 The first steel has been cut for the first new generation Meraviglia-Plus class ship. The name of the vessel has also been revealed. Plenty of news coming from MSC Cruises as the first steel has been cut for the new generation Meraviglia-Plus class at the STX France shipyard. The cruise line also revealed the name of the future ship as MSC Grandiosa. During an event at the shipyard in France, another future MSC cruise ship MSC Bellissima also hit a major construction milestone. In our other post, the MSC Bellissima celebrated its coin ceremony for the first construction block. The vessel will become the sister ship to MSC Meraviglia and the second in its class entering service in March 2019. MSC Grandiosa has now officially started physical construction and moves out of the design and preparation phase at STX in France. The future cruise ship will still have some major milestone to hit including the keel laying, fitting out and sea trials. Once completed in November 2019 it will be the largest cruise ship in the fleet. MSC Grandiosa will be a massive 181,000 gross tons and will surpass the current biggest ship in the fleet MSC Meraviglia. The under-construction MSC ship will also have a length 1,086 feet and a maximum capacity of 6,334 guests. Right now MSC Cruises has four cruise ships under construction including MSC Seaview, MSC Bellissima, MSC Grandiosa and MSC Seaside which will arrive in December 2017.